1) Probably the first to appear are attempts to fit the flak 38 into a unaltered 251 body. 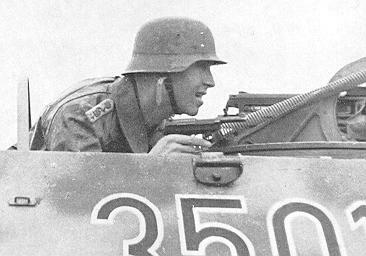 Probably Wehrmacht field modification. A pedestal brings the gun to height. Seen is a /D. The very limited traverse of the gun (80 degrees) leads to other tests. This was thought to be a Flak 30 or 38 but it's an aircraft turret. Versions: C and D reported. Picture: A vehicle of the "Grossdeutschland division" Known for their enterprising engineers. Picture: Detail of the next picture taken. A handle detail, from the Squadron/Signal book on 'Panzer Grenadier Division Grossdeutschland'. 2) Most photographed is the "Luftwaffe-Flakausführung" (airforce anti-aircraft version). This has extended sides that give the gun a 360 degrees rotation freedom. The sides also can be lowered to create a platform. 10 pieces and two command vehicles are constructed. The command-vehicles are similar to the AA vehicle but without the gun. These command vehicles are equipped with wireless and a frame-antenna for the FU-10. One command vehicle leads 4 flak vehicles. Shields down, 360 degrees unprotected sky. The command vehicle gets the same collapsible sides without the gun. 3) Auto-Union A.G. of Chemnitz is awarded contract number 4911-021300306/42 to produce 2400 superstructures at the Horch assembly plant in Zwichau. March 1944 sees the first 5 completed. At the end of February 1945 a total of 604 are produced. Production continued in March April and May, but production statistics didn't survive. The target was 50 a month. It is a hybrid, the front section is 251, behind the drivers seat the amour is newly designed to protect the seated crew and the ammo. It resembles the earlier unarmored platforms at the rear on the soft skinned halftracks. The technical number is Sd.Kfz 11, though some sources name this version Sd.Kfz. 30, some 261. It is seen on west and east front. One picture shows 2, another shows one being employed by a Russian unit. There is also a cargo variant. 4) The final solution comes from the Wehrmacht. A special mount called "Schwebelafette" (gliding cradle). The gun is in a boxlike construction, mounted in a standard body. This appears in 1944 on the D version only. Part of well known picture. A GI inspecting an abandoned vehicle. The bench hanging out of the door. In 1941 the FlaK 38 (2 cm) proves not capable to penetrate the Russian armored planes, usually the Ilushin 2. Therefore it is strange that AFV's where equipped with it for air-protection, almost throughout the war. One would expect a better gun. The official records first list the /17 in October 1944. 11 are available on the eastern front. In November there are 15. A German recognition manual lists it in late 1944. Discussion about the gun started with Fréderic Carbon. He found a remark on the barrel of the gun indicating that it was a different one from the previous 3 versions. Could it be the KwK version? 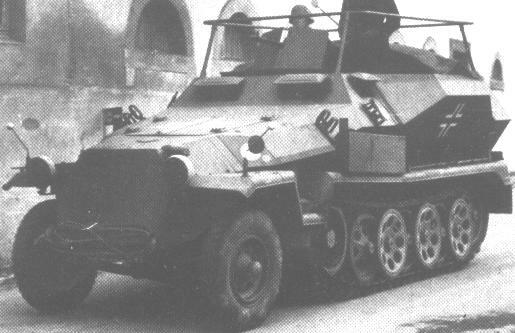 Several records say that the "Schwebelafette" that was in the Sd.Kfz. 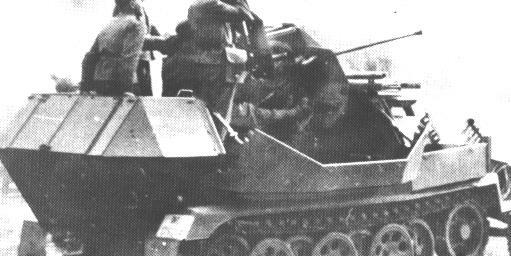 234 also is equipped with the KwK instead of the Flak gun. 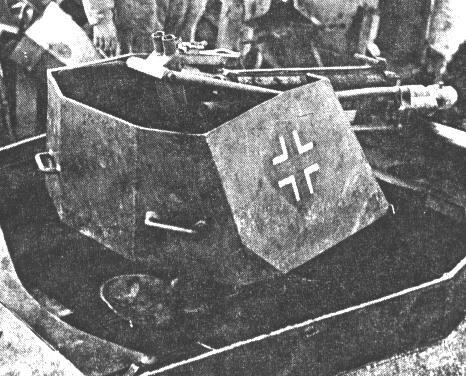 Furthermore the barrel of the Flak-version is used on the KwK. Luftwaffe version: crew of 7 or 6, Schwebelafette crew of 5.